Do you know how to become successful in business? how to instantly improve your customer attraction performance at no cost. how to make your customers yours and only yours. how to be the kind of boss that employees actually want and explode productivity and customer satisfaction at the same time. how to avoid the pitfalls of desperation advertising. how to talk only about what interests your customers and prospects and avoid the waffle that turns buyers off. 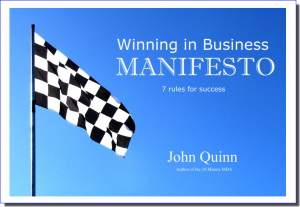 The good news is that The Winning in Business Manifesto is totally FREE! And you get regular updates from me as well, including the Friday Power Pack. Just fill in your name and email below.